Jacob Grimm (Karlheinz Bohm) ekes out a living as a writer-for-hire in 19th century Germany while his less practical brother Wilhelm (Laurence Harvey) prefers to find and record local folk tales — including three brought to life in this film: “The Dancing Princess”, in which a woodsman (Russ Tamblyn) utilizes an invisibility cloak to secretly pursue a princess (Yvette Mimieux) at night; “The Cobbler and the Elves”, about an overworked cobbler (Laurence Harvey) who receives help from animated elves in filling an important order; and “The Singing Bone”, in which an unscrupulous knight (Terry-Thomas) unwisely tries to hide the fact that his servant (Buddy Hackett) has slain a vicious dragon. 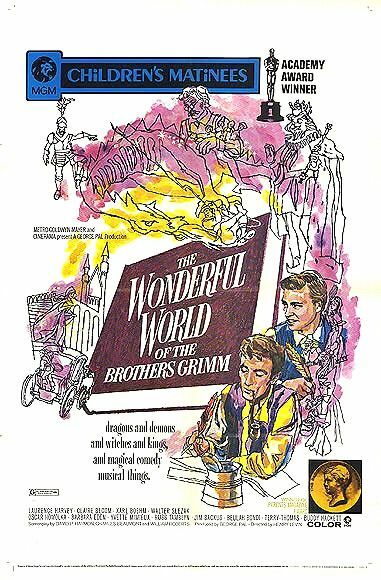 The Wonderful World of the Brothers Grimm — co-directed by George Pal and Henry Levin — was the first fiction film made in the short-lived Cinerama process, which utilized three lenses to create an arced image curving 146 degrees. Unfortunately, while Cinerama was a uniquely creative way to showcase around-the-world travelogues on a vast scale, it was a terribly conceived choice for this fanciful “biopic”, given that we lose all sense of intimacy with the lead characters, who are literally overwhelmed by the gigantic screen they’re portrayed on. It doesn’t help matters any that their personal dramas — Bohm shyly romances a beautiful girl (Barbara Eden) who’s inexplicably smitten with him; Harvey’s wife (Claire Bloom) is distressed time and again by her husband’s fiscal irresponsibility — are terribly dull, and take up far too much of the film’s overlong running time. However, it’s Grimms’ fairy tales themselves that most viewers will be eager to see brought to life — though the stories selected to showcase here are lesser-known, and none are particularly compelling. The first tale (“The Dancing Princess”) primarily functions as a vehicle for Tamblyn’s dancing, as well as for the Cinerama process itself, with an extended carriage chase sequence far-too-obviously designed to show off what virtual reality tricks the camera could manage (i.e., Tamblyn dangles precariously down from a broken bridge hovering thousands of feet above a roiling river). The second tale (“The Cobbler and the Elves”) is primarily a vehicle for George Pal’s puppetoons, who come to vivid life during a modestly enjoyable musical sequence. The final tale — “The Singing Bone” — possesses a strong narrative arc and a nicely handled twist ending, but relies far too heavily on cartoonish slapstick for laughs (i.e., when the animated dragon breathes fiery air onto Hackett’s metal suit of armor, and hot steam emerges from Hackett’s nostrils). With all that said, TWWOTBG is the type of colorful, escapist fantasy fare that just might appeal to kids of a certain age — at least those not jaded by more sophisticated animation styles. Unfortunately, it’s not yet widely available on DVD, most likely because the only surviving print (which suffered from water damage during a studio fire) shows distractingly clear evidence of the dividing lines between the three filmed “panels”. Interestingly, this visual artifact is somewhat fascinating at first, given that it helps us more easily imagine seeing the movie projected onto a much larger, curved screen — but it’s ultimately too distracting, and definitely merits “cleaning up” by a restoration team. No, though diehard film fanatics may be curious to check it out for its historical relevance as a rare Cinerama picture. Not a must and rather in agreement with what’s written. The main drawback in this film is that it is terribly dated and its stodginess overwhelms it. The dialogue is somewhat painfully pedestrian. The score – something which would normally elevate a film of this type – is forgettable. The performances are serviceable but can only offer so much, considering the limitations of the script. So, all told, we have something of a labored effort here. The time moves slowly indeed.